You all know by now that my mom is the decorating connoisseur (just look how she handled my entire wedding 1, 2, 3). I went shopping in her craft drawer and she gifted me these cutie ghostie face decals that can be put on any glass. Naturally, my theme of ‘go big or go home’ had me pasting them on wine glasses and water glasses. With a few left over just in case. My best friend gifted us all punny stemless wine glasses and I am not ashamed to say that I love them so much, I might use them post-Halloween. After all, we’re only here for the boos. Being in an apartment has caused Chris and me to really think about the physical things we purchase - including decorations. I love celebrating the change in seasons (now that I’ve found an indoor pool, I’m not as bitter…) and in the Marciano household, we party with fun napkins and dish towels. I am terrified of fire, yet love to look at all things like fireplaces, fire pits, and candles. Candles make the ambience totally cool and adult, plus Chris loves them. Wins. My party guests delivered. Between homemade cupcakes, classy cheese, fancy crackers, and good wine we were in absolute heaven. If people offer to bring things, let them! If your party is mostly appetizers and desserts (what other kind of party is there…? ), it’s so easy for your guests to cook/bake/buy. Chris loves to cook and I am learning to love to entertain, so we decided to ‘splurge’ and finally get some serving plates. 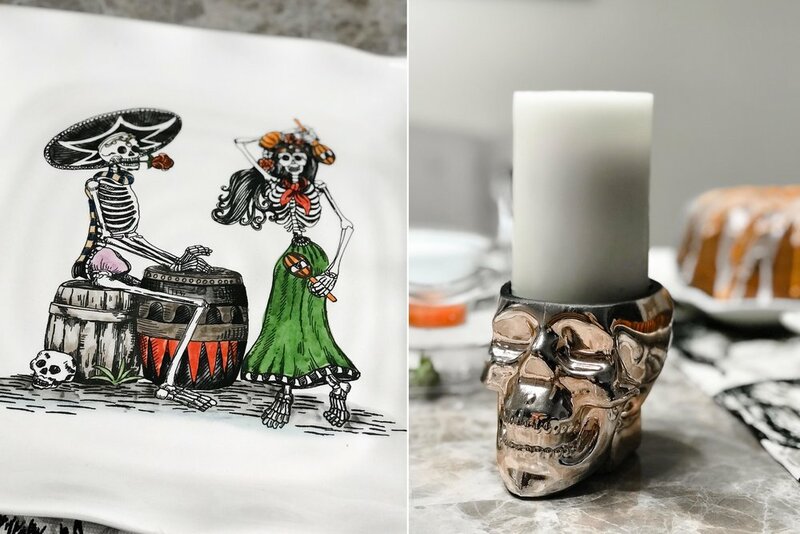 He picked these awesome Day of the Dead plates, which he convinced me can be used year round. I mean, who’s about to tell me they can’t?